Childhood obesity affects 13.7 million children and adolescents in the U.S., but parents need to be focused on health issues rather than weight or body shape. It’s important, then, for parents to encourage their children to be active and develop healthful habits as they grow and develop. During such conversations, however, Bryant physical therapist Adam Carson says setting a positive tone is paramount. According to a 2016 Journal of Pediatrics study, more than half of kids ages 9 to 14 say they’re dissatisfied with the shapes of their bodies. Such negative self-image at such a young age, according to Carson, can lead kids down unhealthy paths, both physically and emotionally. Childhood obesity affects 13.7 million children and adolescents in the U.S., but according to Carson parents need to be focused on health issues rather than weight or body shape. DON’T make it about weight. Being physically active has several benefits that have very little to do with weight. So, don’t make health synonymous with the numbers on a scale. Help kids accept who they are and what they look like. DO focus on the benefits. When talking to kids about being physically active, make it about these benefits, both physical and mental. Exercise helps make you feel better, keeps you stronger, helps you concentrate and perform better in school, helps you sleep better, etc. Make these benefits and others the focus of your conversations. DON’T make exercise a chore. Yes, as adults, the prospect of hitting the gym every day can feel like a pain at times. But, always keep in mind your kids are watching. Help them understand why you take the time to keep yourself physically fit and why you want such benefits for them. Exercise should be fun, especially for kids and teens, and it’s up to us adults to encourage this. Play with your kids, but also be there with encouragement and resources if/when they show interest in something new like a movement-based hobby (i.e., cycling, skateboarding, running, etc.) or joining a sports team. DON’T exclude kids from your activities. 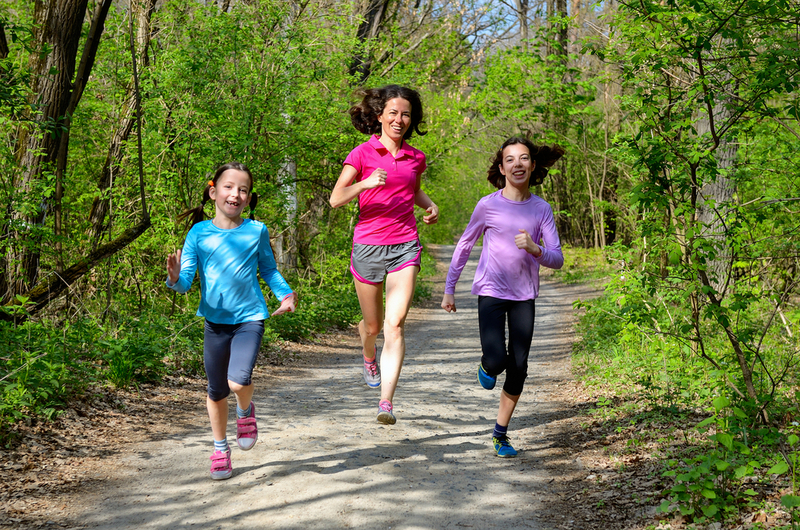 If you have any movement-based passions of your own, like running, cycling, hiking, skiing, etc., include your child. Sharing what you love with who you love is an invaluable way to communicate to your child that such activities can provide a lifetime of fun and appreciation. If pain, injury or other movement limitations are keeping your child from activity, Carson suggests visiting a physical therapist. A physical therapist can assess and treat many such limitations, and even provide suggestions and modifications that will allow a child to more fully participate in their activities of choice.